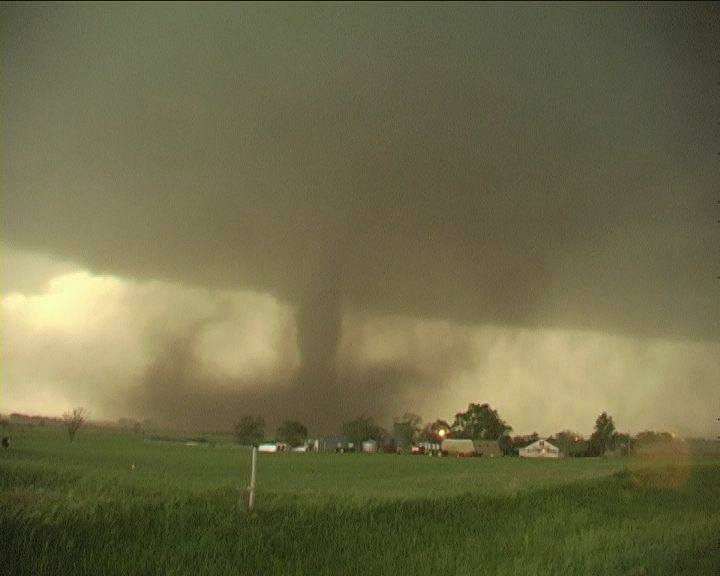 Our 2003 US trip may have been low on tornadoes intercepted but 2004 went beyond anyone's expectations! 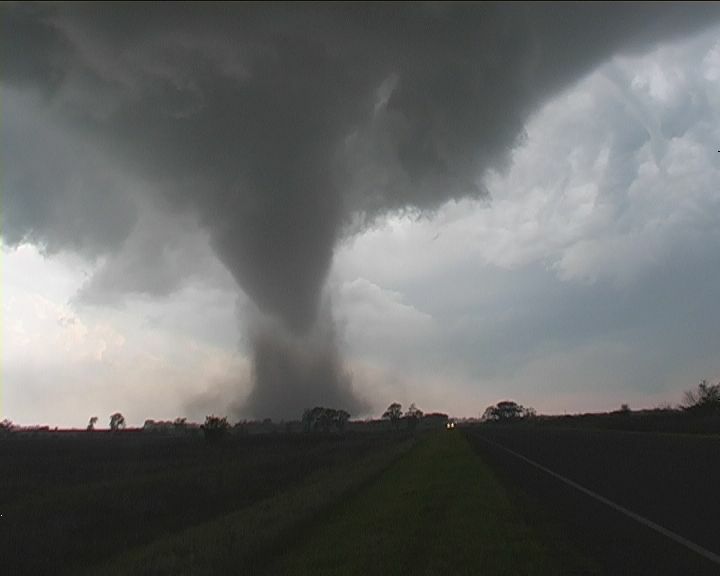 It began slow but it was May 12 in southern Kansas that the tornado feast began. 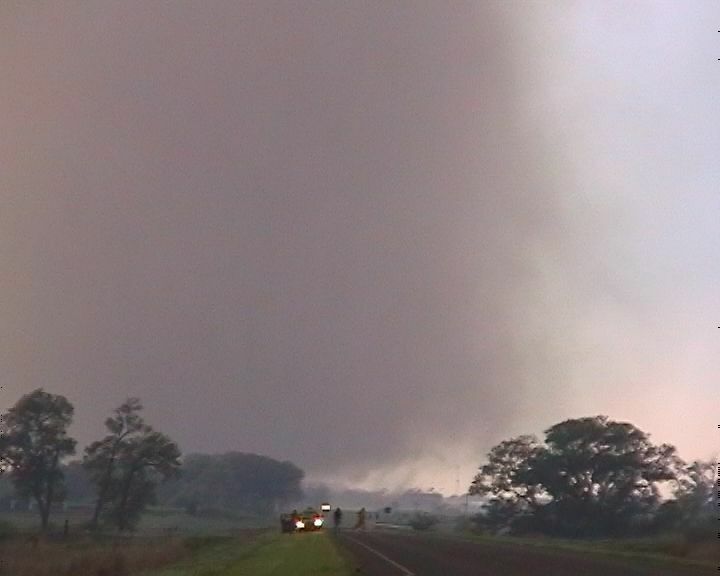 This report discusses the main tornadic events - May 12, May 24 and May 29. For those who prefer articles in brief, David has done an excellent job in providing a picture essay of these events and others on David Croan's site. A cold front had moved south into south Central Kansas with a hint of moisture return indicated by the mid 60F dew points moving through northern Oklahoma. But it was the dryline that was to set up some magic on this day. We targeted initially the region just northeast of Dodge City but due to uncertainty about the moisture return did not commit. We remained in the Garden City library until there was reason to move. 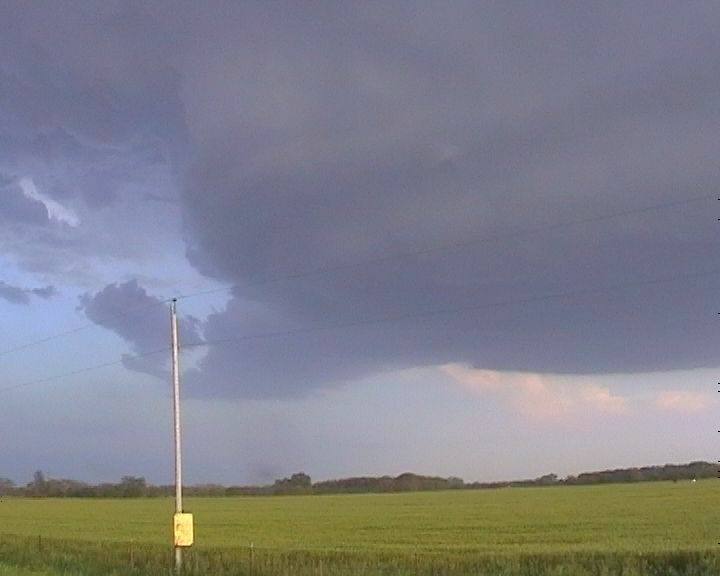 Towers could be observed in the distance along the cold front and also nearer the dryline. 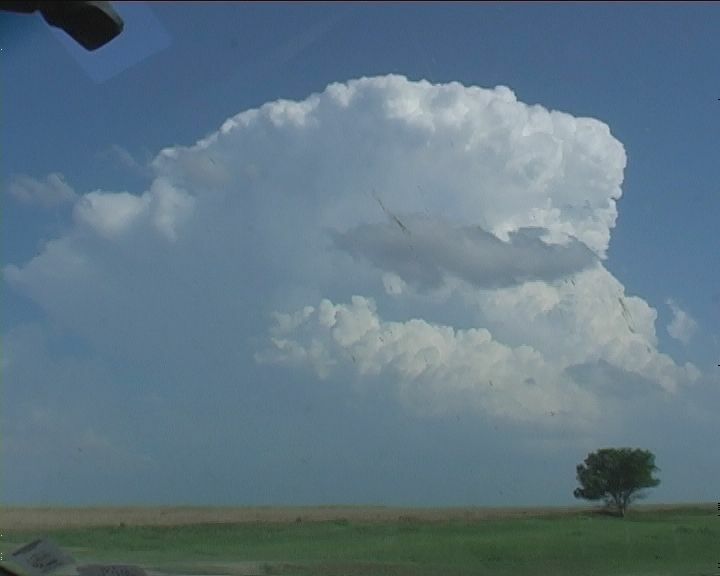 David and I immediately took a liking to the dryline powerful, crisp updrafts despite having not broken through the cap. On approach, the storm finally exploded with powering anvil bulges against the upper wind flow. 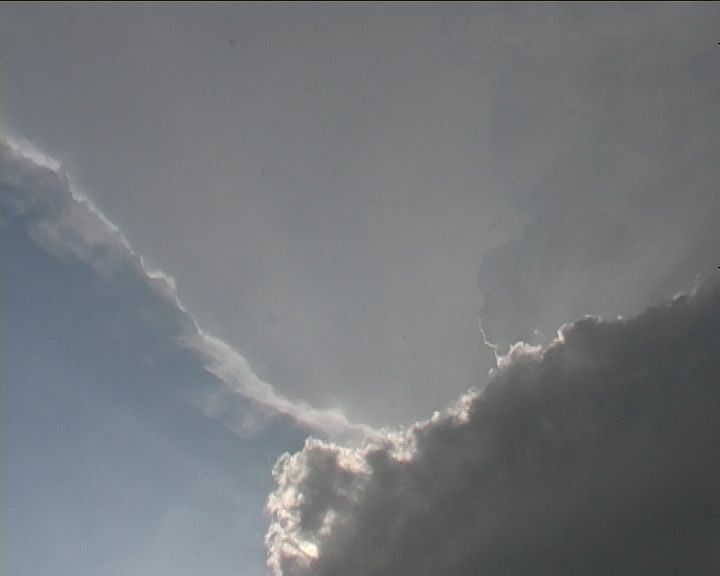 Rotation was evident in the corkscrew updrafts. At this point, time was critical to reposition on the eastern side. Isolated hailstones to 5cm pounded the road and vehicle though insufficient to halt our progress. Decision time – do we remain in contact with this rotating LP supercell or head for the storms further east? On inspection of the updrafts, the eastern option was chosen. 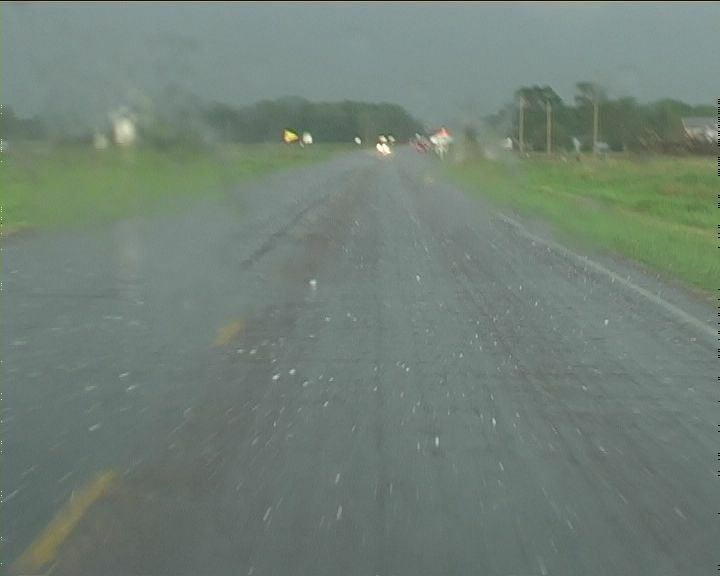 Large droplets splattered the windscreen followed by hailstones to 2cm, ….and then golf balls, and finally….isolated base ball sized hail. A tornado warning is aired on radio for the storm we had left but David notes rotation in the base just to our southwest. A clear slot is observed. Positioning at this point is crucial as the vehicle could easily fall victim to isolated giant hailstones from the vault. 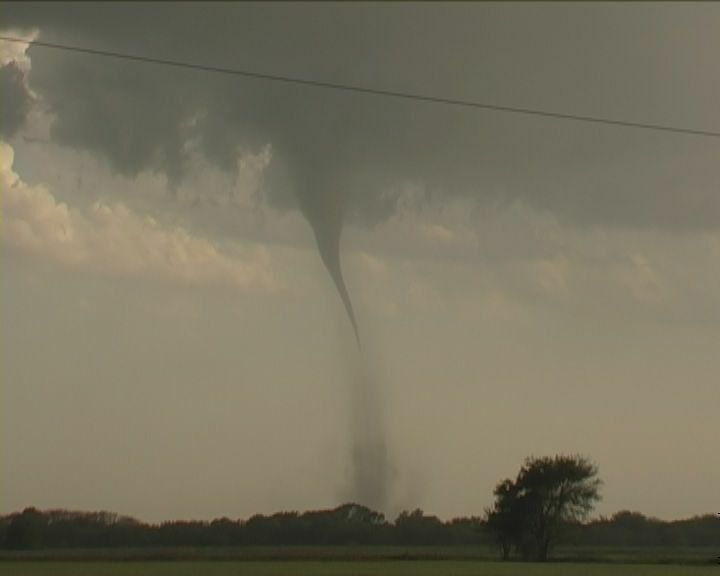 A funnel – and the infamous tornado warning signal for this storm. We knew we were in for action. After stopping, the tripod was mounted just in time for the first dust whirls. Wow!! I went hysterical as we had finally nailed tornado number one. The dust was forced into a plume and slowly the condensation funnel descended towards this plume. I could hear shouts of excitement down the road so I joined in. Hail once again began to pound the vehicle so I had to protect the camera – moving it under cover. David in the meanwhile zoomed in on the tornado. Photographs were taken and documented. This was turning into a near perfect chase where one could position and relax. 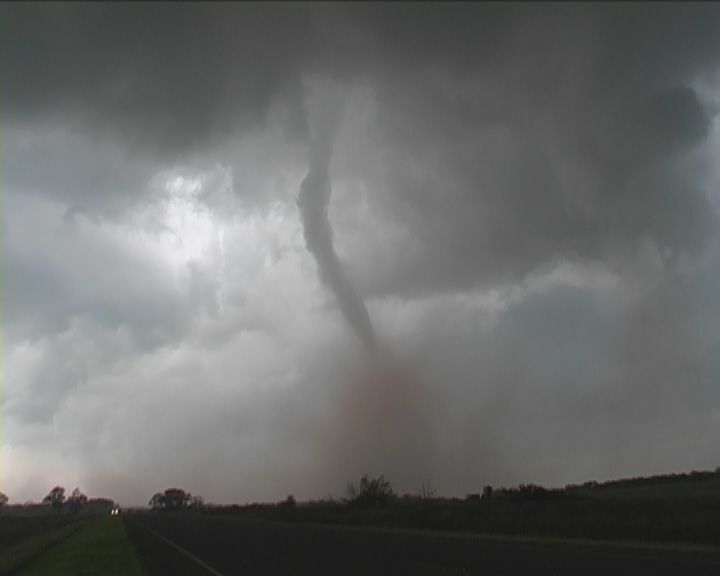 The contrast on this tornado was decreasing and the tornado roping out so we repositioned in response to a new mesocyclone. 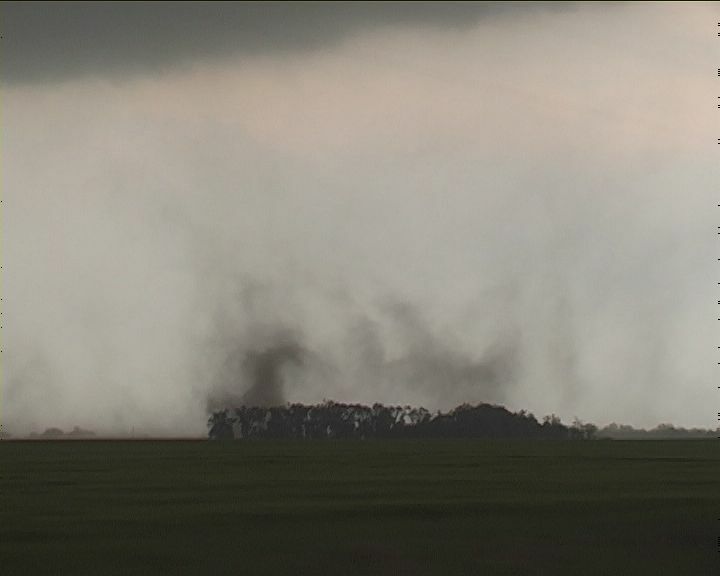 Same behaviour once again – increasing rotation and funnel followed by dust whirls but this time - a stronger tornado. 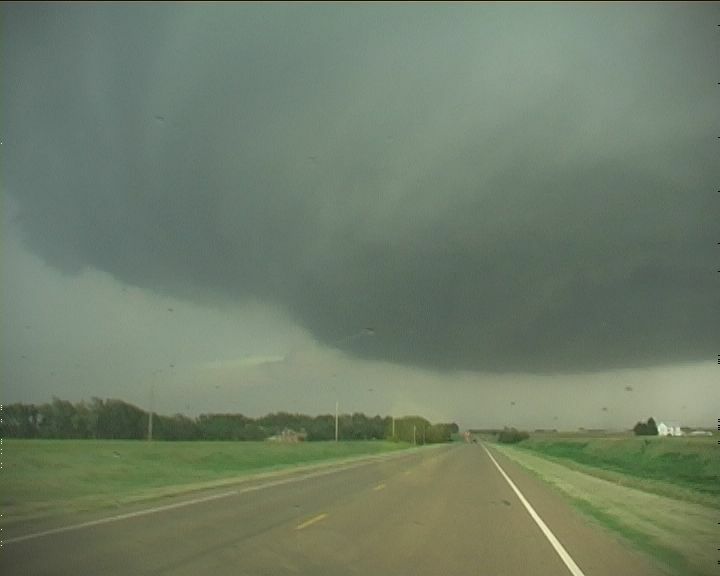 And what an awesome clear slot – this classic supercell was the most impressive we had observed. Fortunately from our perspective, David and I were able to hold position and film the whole evolution of the tornado into the rope-out stage – fantastic. I was trembling with excitement, or was it the hidden danger that was not too far away. We did not realise that a house had just fallen victim to the tornado – simply obliterated. Another mesocyclone emerges – time once again for repositioning. Moving further down the road – David shouts – “Look at that. There’s a spin up behind the car. Where’s the video camera!”. The dark Kansas dirt had spun up in a whirl behind the vehicle. Driving, I was not in a position to see it but I did observe another set of dust whirls moments later – this time in the field. 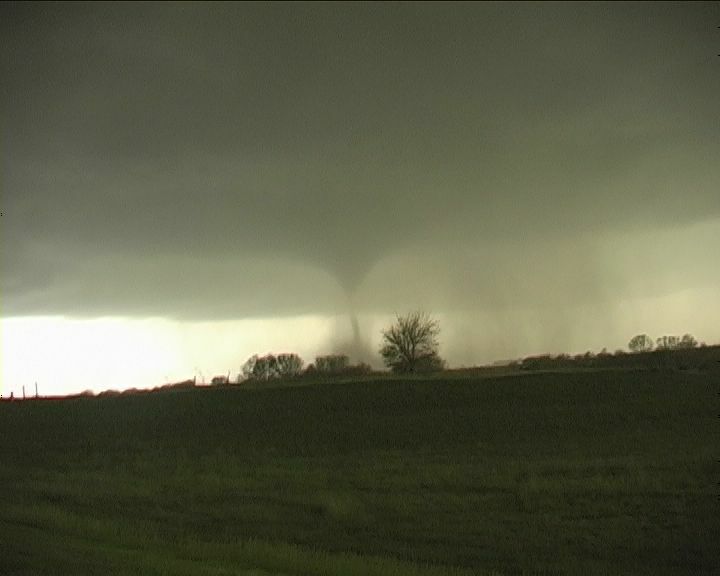 The development of another tornado was in progress. Setting up tripod once again, the whirls increased and a funnel descended but this one just did not go get its act together. And now the next mesocyclone - David and I just looked in awe as a beautifully sculptured mesocyclone mass rotated above our heads. 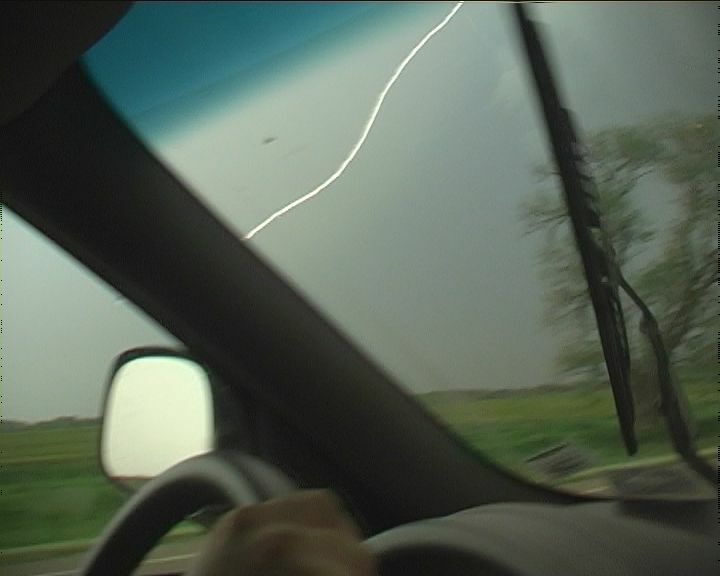 Smooth lightning bolts pierced the earth ahead of us – a warning sign to remain in the vehicle. 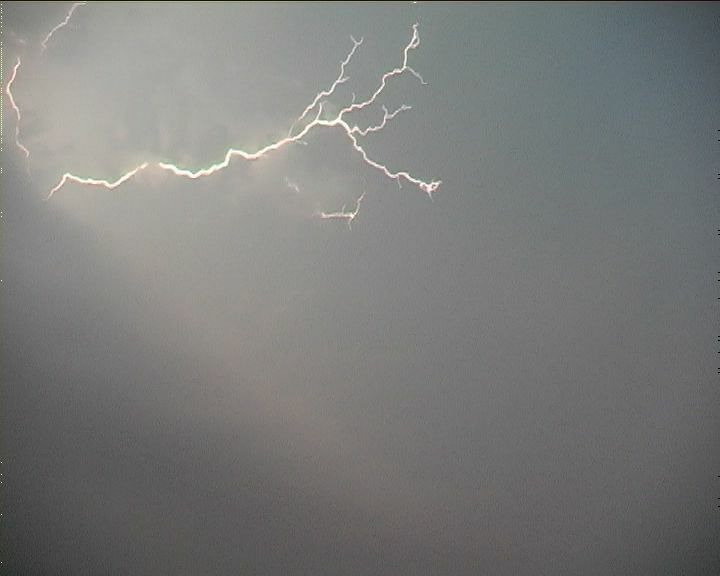 These bolts were no joke - the loud crackling thunder gave a new meaning of the warning for ‘dangerous lightning’. 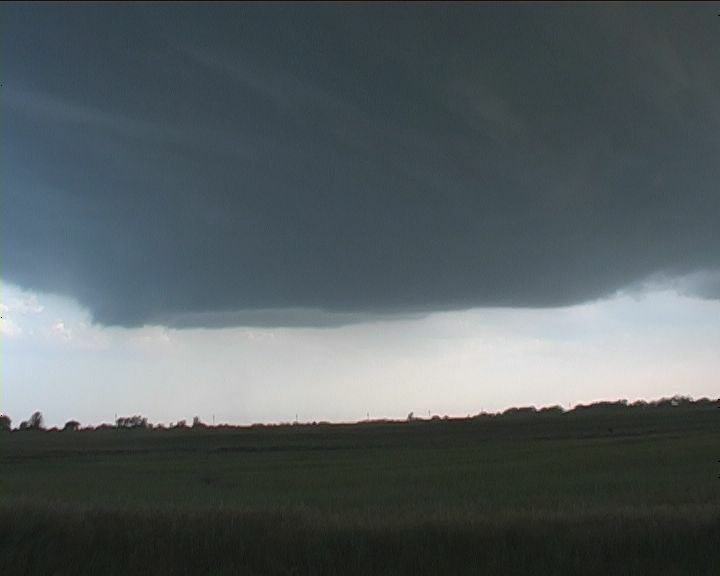 Repositioned at the new now large rounded rotating mesocyclone, we watched organisation at an accelerated rate. 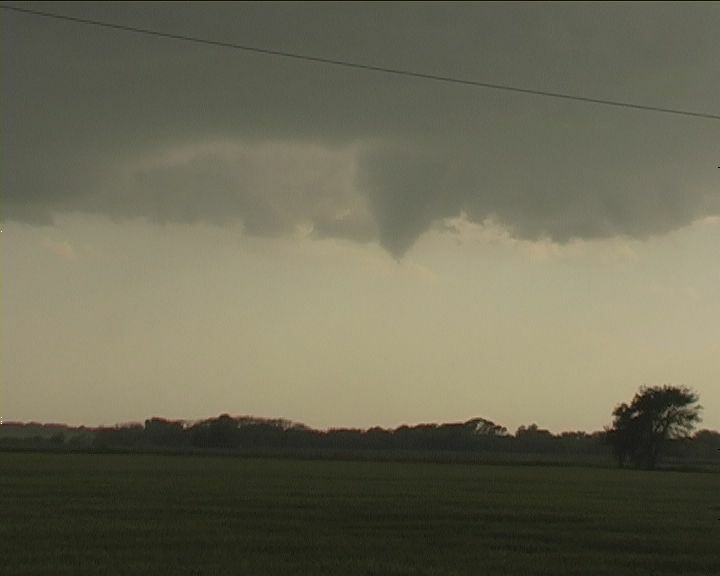 The tornado and funnel behaved similar to the others though this time quickly became stronger. We repositioned at the end of route 160 that had an option south or north. 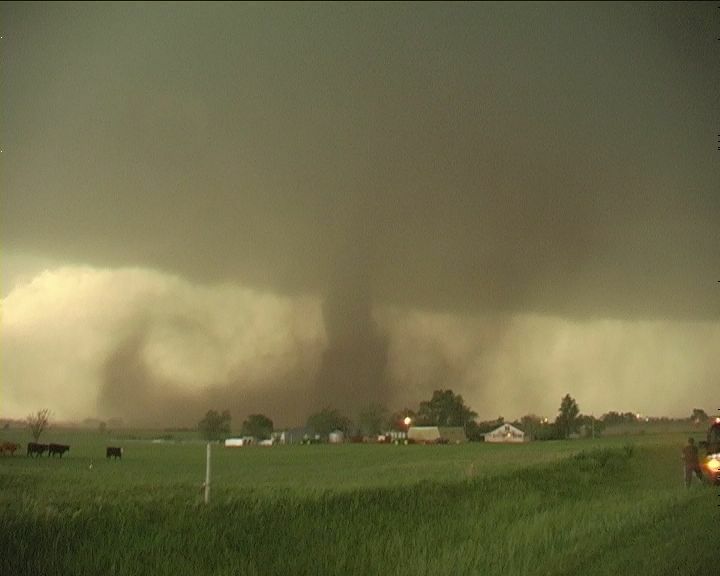 The tornado had grown to a large stove pipe chewing dust and debri to our southwest. 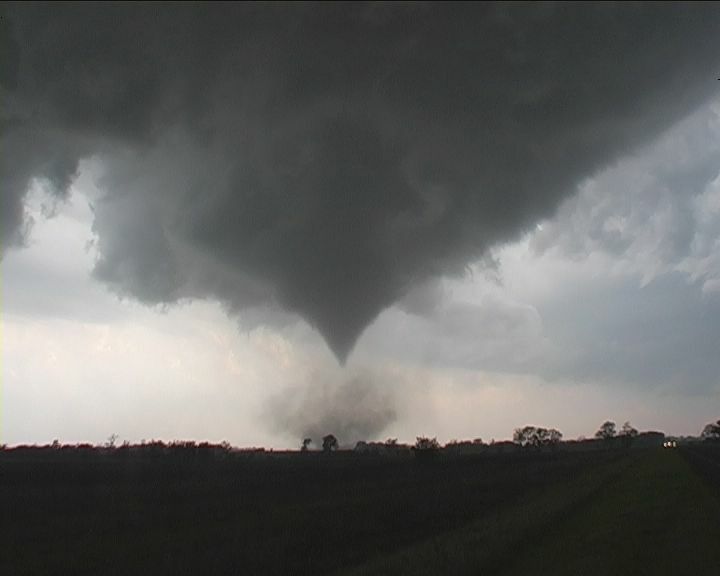 We simply could not believe that this storm was popping out tornadoes at will and the contrast – unbelievable!! 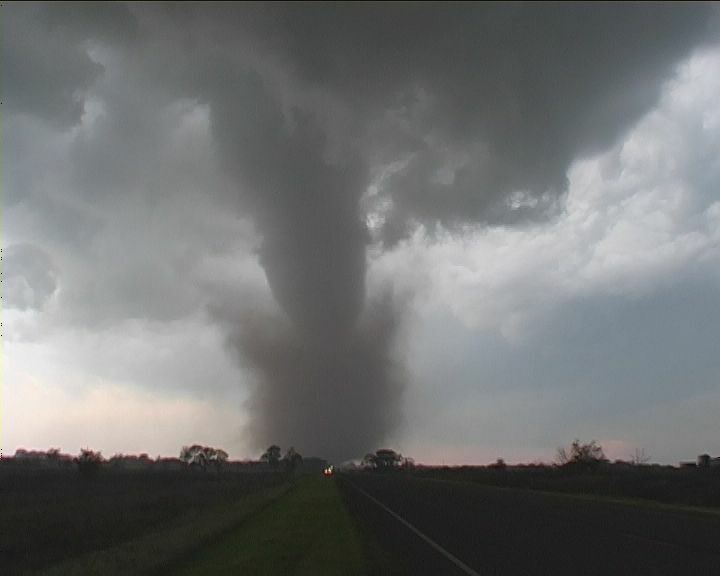 The mass of dirt and debri spun rapidly around the tornadic base and flared outwards. It was simply awesome. Dashing south was a safe move since the road ahead was gravel – certainly not the best road to contend such atmospheric violence. 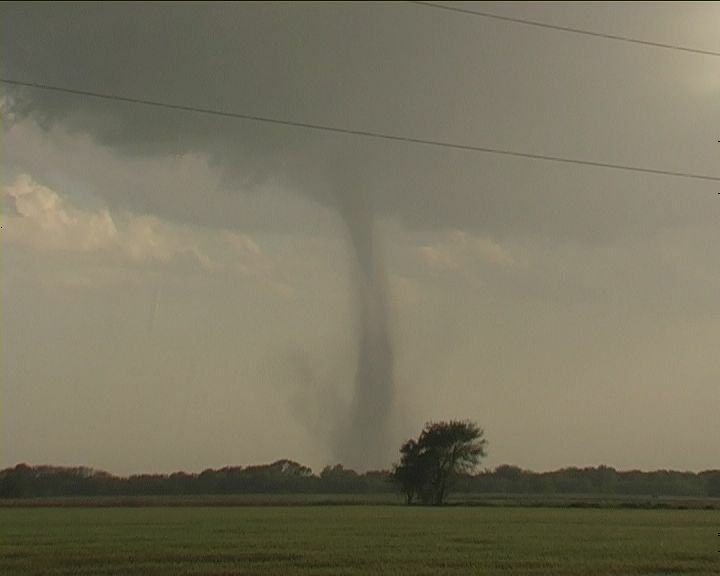 The tornado approached rapidly but curving northeast allowing us ample time to reposition to its southeast. Little time was wasted setting up tripod. I took a breather at this point. I guess it was time to relax and enjoy our catch of the day - an eerie scene of green pastures contrasted by this rotating mass of dirt. Then suddenly, almost to script, whilst filming the tornado, a herd of cattle race in the direction of the tornado from off screen - a scene from Twister? Hmmm not sure what they were thinking – perhaps instinct suggested danger. 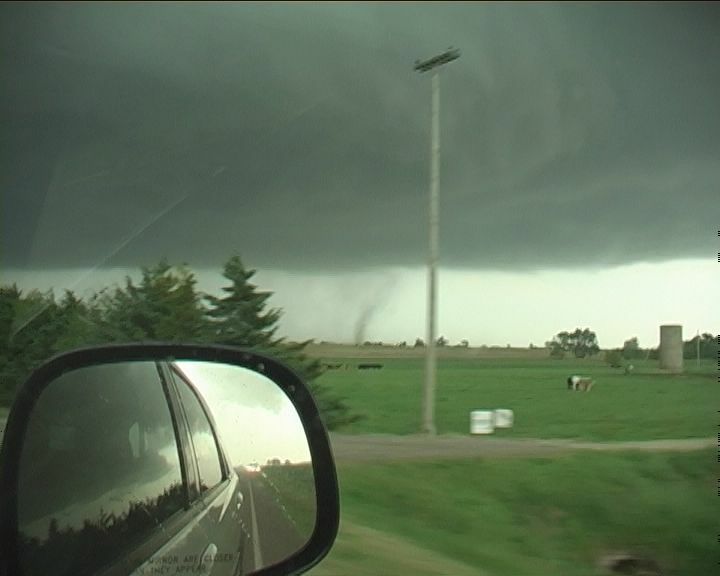 The rear flank downdraft hooked around spraying rain onto my camera – end of the tornado show. The tornado had become rain-wrapped anyway. 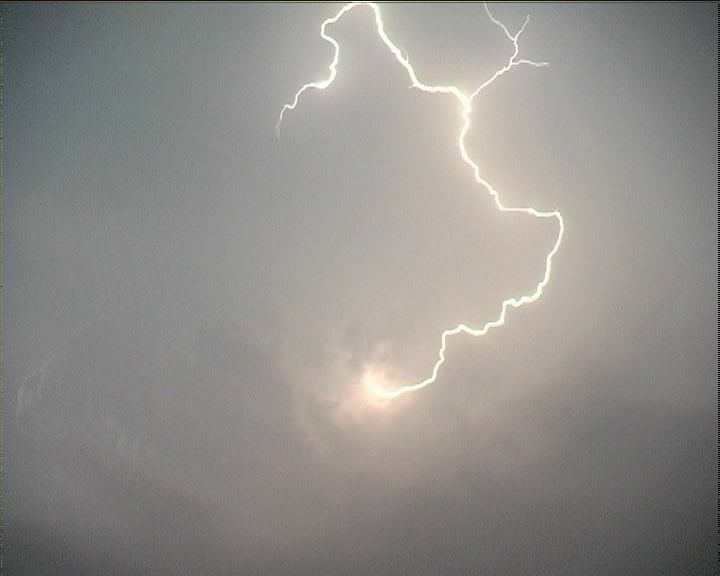 With dusk, the lightning show had begun, lightning strobing from the anvil and updraft core like sparks flying off a Van der Graaf Generator. The supercell simply had too much energy that it had become electrified. There was ample opportunity to film the show concentrating on various angles and regions of the storms – I mean where do you point – the whole storm was sparking. 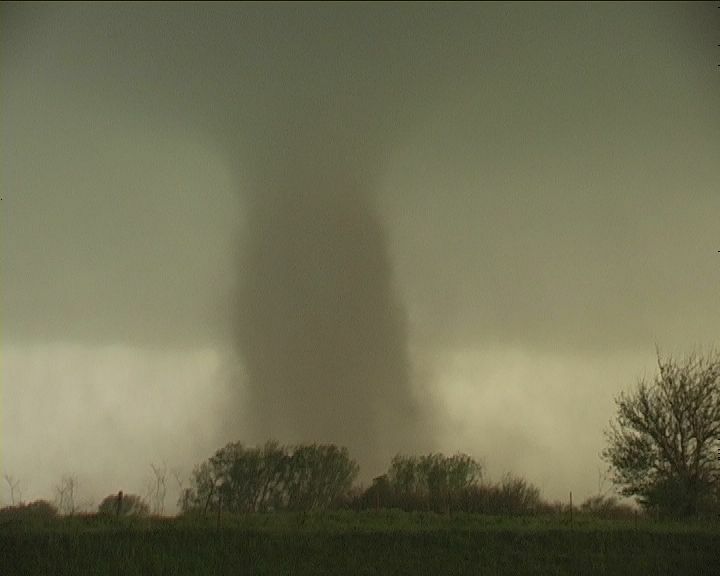 Powerful inflow raced in towards the storm – another couple of tornadoes descend in the darkness. 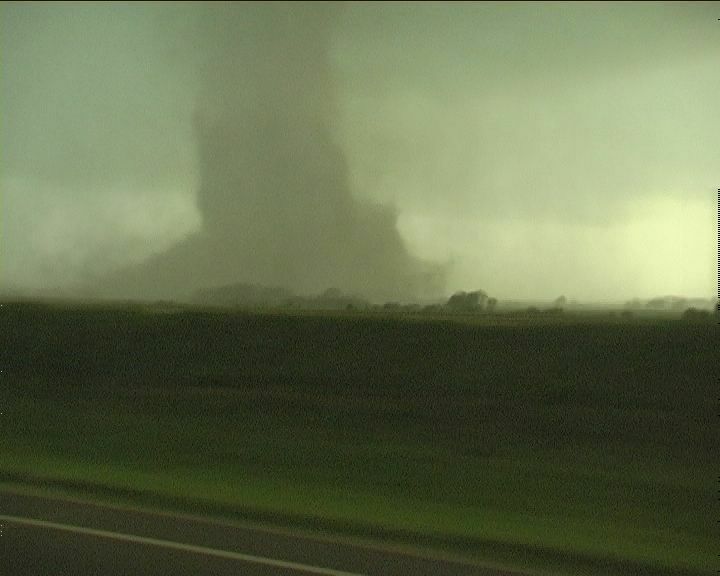 We learned of another violent tornado that had spawned from the storm we were on but cut off from road options. What a way to end the day though! 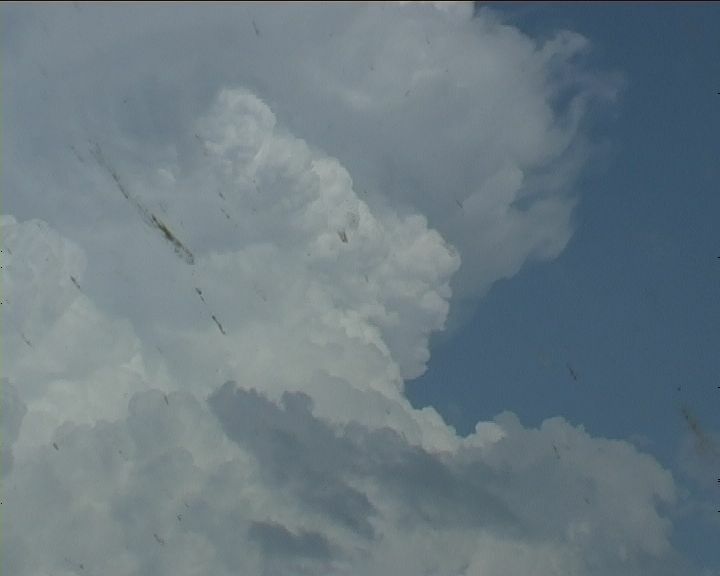 David and I were simply awestruck by the whole event – powerful updrafts, the giant hailstones, the lightning and of course the impressive tornadoes – not bad for a slight risk event.